Two locals in the Yobe state capital said suspected IS-linked Boko Haram fighters were behind the attack, which began late afternoon. "Boko Haram jihadists launched an attack on Damaturu at about 5:45 pm (1645 GMT), firing guns and throwing explosives," Adamu Sani, a trader in the city's Maisandari area, told AFP. "Residents and businesses all closed as we fled into the city to avoid being caught up in the attack. While fleeing into the city, I saw truckloads of soldiers heading to Maisandari." Hashimu Idris, a civil servant, added: "Everybody is indoors. We pray the soldiers push them back otherwise it will be another disaster in the city. "This is the first attack on the city since 2014." That raid followed a bomb attack on June 18 that year that killed some 21 football fans watching a World Cup match at a public viewing centre. The previous October, 30 people, all of them thought to be soldiers, were killed in a gun and bomb attack on police buildings in Damaturu. 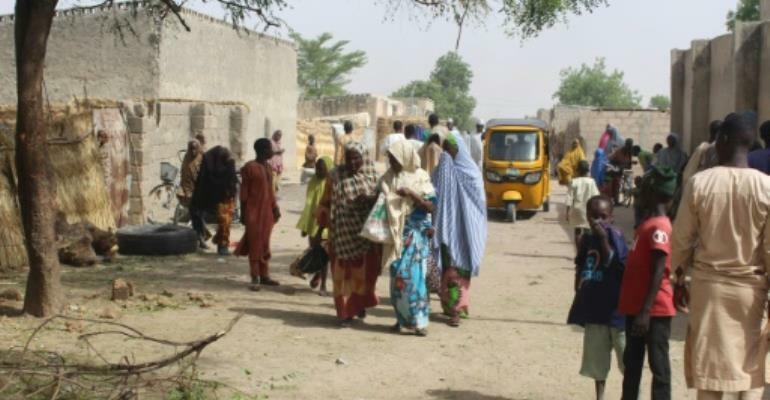 The latest attack followed the evacuation of some 2,000 people from Jakana village, some 90 kilometres (55 miles) from Damaturu on the road to Maiduguri, in neighbouring Borno state. The National Emergency Management Agency (NEMA) said troops escorted the residents to the Bakassi camp for internally displaced people (IDPs) in Maiduguri "for their own safety". NEMA northeast coordinator Abulkadir Ibrahim said the move was "a result of ongoing operations to flush out insurgents in the area". Jakana residents said they were given no notice. One of them, Modu Kaka, said: "The soldiers came this morning and told us to assemble and began herding us into trucks. Bakassi is one of several IDP camps housing tens of thousands of displaced people, who live in squalid shelters and rely on food handouts from aid agencies. An unnamed military official said the evacuation was in preparation for a "big operation" against Islamic State West Africa Province (ISWAP), the IS-linked faction of Boko Haram. The conflict has spread to neighbouring Niger, Chad and Cameroon, prompting a regional military coalition against the jihadists.